My goal, always, is to develop healthy soils that can persist beyond the current owner and landscaper – soils that help to maintain diversity at all levels of the living community. I do want to make clear that I am not a soil scientist – or scientist of any kind. I have a bachelor’s degree, but it is in animal science not plant science. Replicable experiments are the gold standard of course, but I’ve never been very fond of gold. I’m much more into practical measures that anyone can try and get results from. Everything that I now know has come from years of experience tied to research (through over 500 books and multiple conferences and programs), from the need to meet my clients’ expectations, and from my personal goal of creating healthy gardens. That approach has led to lots of experimentation over the years. Some ideas worked and worked well, and some did not! 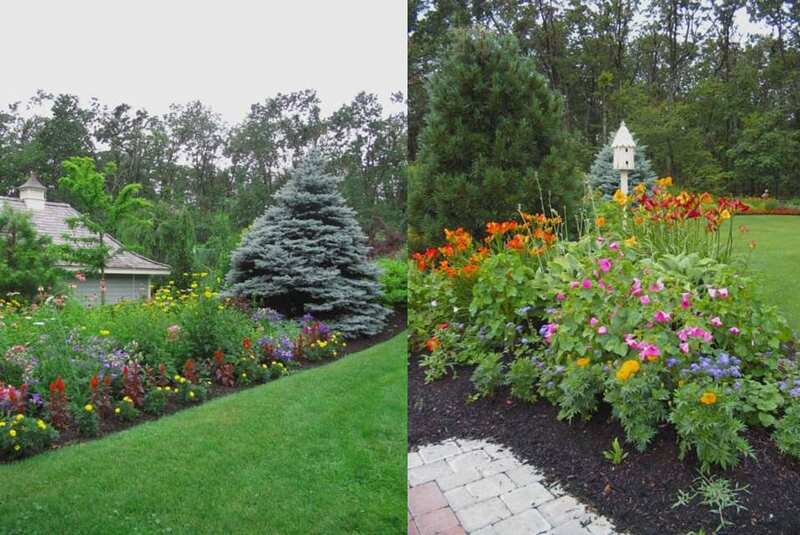 I provide complex, integrated and colorful yards of all kinds to clients who love to be out in their gardens and appreciate the diversity that is found there. I’ve been very lucky with both the gardens that I’ve had a chance to work on and the clients who have let me learn how to manage their situations well. From gardens made from pottery grade clay, to soil results with every nutrient level off the charts, to massively compacted and dehydrated soils, to soils that stay too wet for too long, every property has a story to tell and that I need to hear. Minimizing soil compaction as much as possible benefits carbon and water management. Time and budget constraints are inherent in every landscaper’s decisions, as are the needs of the property owner. The sweet spot is to find the most effective “tricks” you can add to your information arsenal that will answer the needs of the client and the landscape plan, while effecting positive change toward carbon stabilization, if not sequestration. Aim to leave a positive legacy behind you as the property moves on through other managers and owners. First and last, compaction is the enemy of all aspects of carbon and water management, and carbon and water are linked. Do everything you can to minimize your contribution to compaction. That’s much harder than it sounds because it means running the mowing rigs slower in turns, NOT mowing or working over the land if wet. Climate intensification makes this much harder – when we’re dry, we’re very, very dry and when we’re not we’re mud. 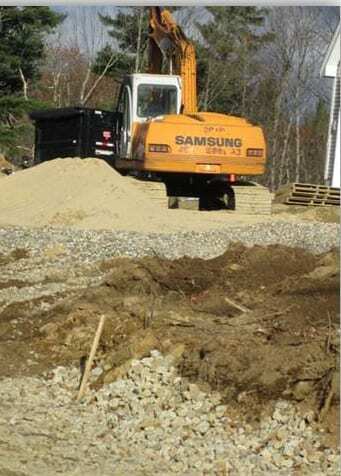 That said, delayed installations and maintenance cost money, and clients rarely understand the subtleties of soil dynamics – even when they’re interested and most aren’t. Growing plants really well – any kind of plant – is the key to both carbon stabilization and carbon sequestration. The healthier the plant, the more diverse and chemically complex the root exudates are and the more likely you are to be feeding fungi and not just bacteria. The more diverse and well grown the plant palette, the even greater diversity of exudate and microbial population. And plants don’t lie. They’re either healthy and energy positive or they’re not. Use tools to test the plants and soil until your eyes and other senses can tell you the plant’s story. Over the last 19 years I have tightened down the formulas that I use as the baseline for all of the gardens I manage. It is an intensive program and definitely not for everyone – or even for most people. I have used this information in educational programs for home landscapers for over twenty years and have heard from people over the years and in various locations that it works for them as well. They don’t apply the program as intensively as I do, but the results still work better than anything else that they have tried. Never forget that your best assets are your eyes and other senses (you have six!) – tweak these formulas so that they work for you. These formulas/recipes were worked out for the central upland area of Massachusetts – essentially Worcester County – and would need considerable adjustment for other distinctly different geographies. Use soil tests, compaction tests, visual and textural tests, and any other source of information you can find to help you unwind the history and the reality of any given soil situation. Following are the lists of resources that I use. This first list includes products directed at the base problems of soil – getting it to come to life. Experiment with this group first. Basic sugar easily added to water and used as a drench for any weakened plant system. Plants produce sugars (photosynthesis) to shed into their rhizosphere – this can give those microbes the sugars they are starved for and kick the whole system upwards. Any liquid soap, even the cheapest stuff from the dollar store, can be mixed with water (one cup to three to five gallons water – more concentrated if the soil is totally compacted) and drenched into compacted or drought stressed soil. If you have the money and the access, yucca is superb, but trickier to work with – read the label! Mix molasses and liquid soap for even better results. I’ve rototilled water, soap and molasses into an awful compacted and hyper droughted space and then followed up with soap and molasses drenches with superb results. The planting stabilized in record time and has never faltered in over 15 years. Meal not pellets!! In a pinch, you can use alfalfa cubes soaked overnight. Fifty pounds of cubes per 32 gallons water makes a nice slurry to use as an underlay in a mulch situation (don’t let it sit for more than 24 hours – phew!!!!). Both organic and conventional meals are available. Per usual, the organic meals are brutally expensive, but better. I use the organic in my general planting mix but use conventional alfalfa meal for broad landscape application. There are GMO alfalfa fields now, but they are not yet as ubiquitous as soy and corn GMO fields. Look local – almost anything you find that isn’t treated with pesticides to repel weeds etc. is worth looking at and is the least expensive major product you can add. Soil is a combination of raw mineral, organic detritus and micro and macro-organisms, so adding back in that raw mineral component can be very effective. Raw minerals with a known analysis. Along with local rock dusts, they can “feed” the soil system better than chemical fertilizers if you are trying to build a diverse microbiology. That diversity is key to carbon stabilization/sequestration. I have used Azomite for years and am experimenting this year with a load of Mt. Tom basalt stone dust. Premix minerals so they are ready to apply. There has been an explosion of information in this category over the last 15 years. A true, well-brewed compost tea with protozoa and amoeba is the gold standard, and like all gold standards, not always achievable. There’s been a huge influx of inoculant options due to the marijuana industry’s need for the highest quality plants. Drugs are secondary plant metabolites that take A LOT of quality plant to produce. Find out which sources are easy for you to get and experiment with. Look for Glomus sp on the label; these fungi are the best at holding onto carbon. This is the core of immediate carbon supplementation at the moment. The liquid forms are as close to a “magic potion” as you’re ever going to get. They raise the energy of the soil and allow the roots to work much easier. You’ll often see the plants change and green within half an hour especially in containers. The new carbon kid on the block with a very ancient pedigree (the Terra Pretta soils of the Amazon). Use it if you can find it. Not organic (way too cost prohibitive!!) 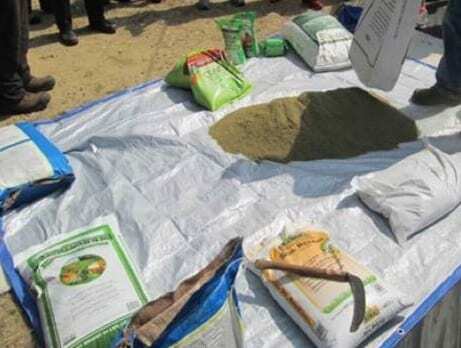 but outrageously effective at waking up a totally damaged soil system if you have six to eight weeks minimum between the time you apply the mash and planting. The mash causes an explosion of bacteria and rapid integration of all other minerals added to the space. I try to put mash down in November for spring planting on sites that I know are a real challenge. Weird but it works. I converted 4” of painted wood chip “mulch” and sand into a decent garden over one winter by layering, tilling in, and water a mixture of mash, lime, and alfalfa meal in October and planting a mixed palette the following May. I use all of these depending on soil tests, client budgets, and site situations. This is a series of “fertilizer” blends I mix these together on a tarp and store in sealed plastic containers, and sealed is the key!!! If these get wet – beware!! They’re designed to spike microbial activity, and they do when concentrated…need I say more?? Basic planting mix – used in all annual and perennial installations. Rate adjusted by type and vitality of plant material and history of the garden. As mentioned above this is mixed together on a large tarp and stored in sealed plastic containers. I mix four to five batches a year. 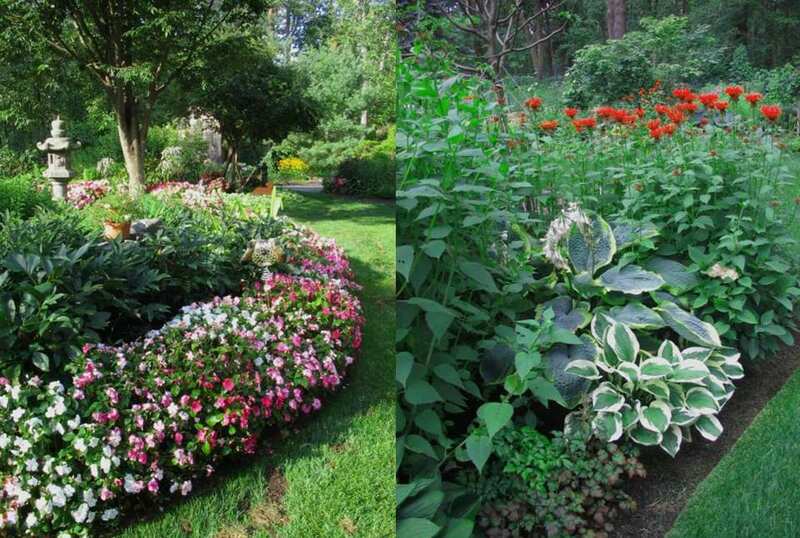 The gardens in these photos have been fertilized using the basic planting mix. Woody planting mix – developed to try and get ericaceous material to settle in faster, but I find that it works really well for all woody material, even a bare rooted, 3.5” caliper locust planted in late May. Prep the roots for planting. Coat the root balls with the mix (work in well with fingers or knife) and work more mix into the top 6” of the soil. Bio-stimulant – so many to choose from. Figure out what works best for you. Woody plants are ectomycorrhizal most other plants are endo-mycorrhizal. Elemental Sulfur, Gypsum and Rock phosphate are added based on soil test results or known problems on the site. Fall soil development mix – used in open gardens that are coming in to production, edges of existing gardens that need refreshing or other soils that need to open up (compaction, etc.). It’s spread on the surface at the rate of about 25 lbs/100 sq ft and either rototilled in if the bed is open, or hand cultivated if the bed is already planted. Promotes a strong bacterial reaction and feeds the worms well – they develop heavy muscles (almost blue in color) that allow them to really turn soil. I’ve included stone dust from a local quarry to the mix for beds in which too much organic material has accumulated with spectacular results. The following gardens have been fertilized using the general planting mix along with the fall development mix. Odd mix out – liquid blend for containers and annuals that need to be held in full color until late in the season for a wedding or other outdoor event. 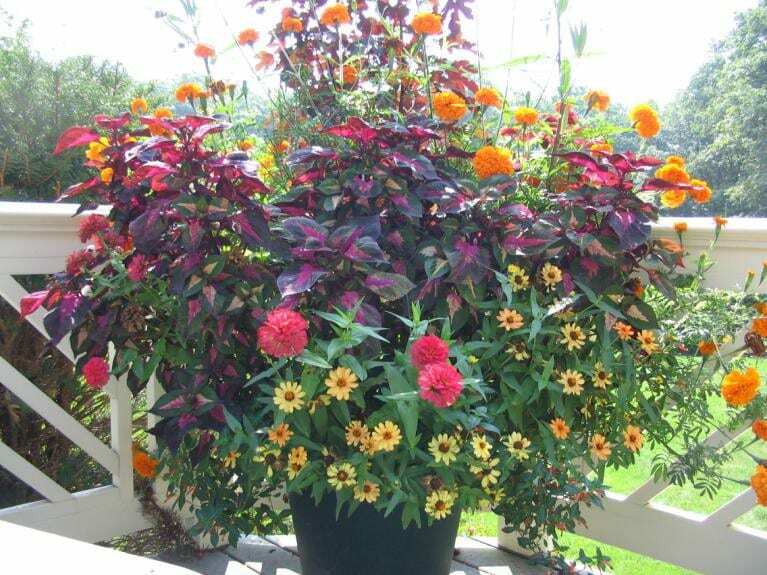 This container looks great in September using this liquid blend. Mix together well and water as usual. Molasses provides an instant source of carbon to buffer the fast nitrate in the Miracle Gro, and the kelp helps to provided tolerance to the stresses of containerization or cold or both. This can also be worked up in a watering can with a 1:1:1 ratio of the first three ingredients and a tablespoon per gallon of the humates. I’d love to hear how others tackle some of these issues that we all work with, or if you decide to try any of these recipes. What did you try and how did it work out for you? If you want to be part of future conversations about these practical issues then let me know that too! Email me at altobelliml260@comcast.net. We can change the world one garden or yard at a time. M.L. Altobelli is one of the founding members of the Ecological Landscape Alliance. She owns and operates M.L.’s Greenery in Motion, a design, installation, and maintenance company that creates specialty gardens to provide color from March through November.